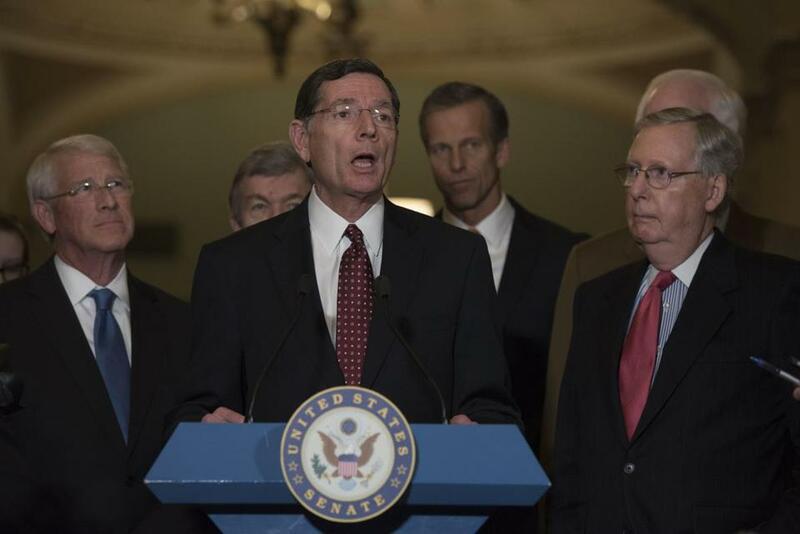 US Senator John Barrasso, a Wyoming Republican, (center) spoke to the media after the Republican policy luncheon on Capitol Hil last Tuesday. 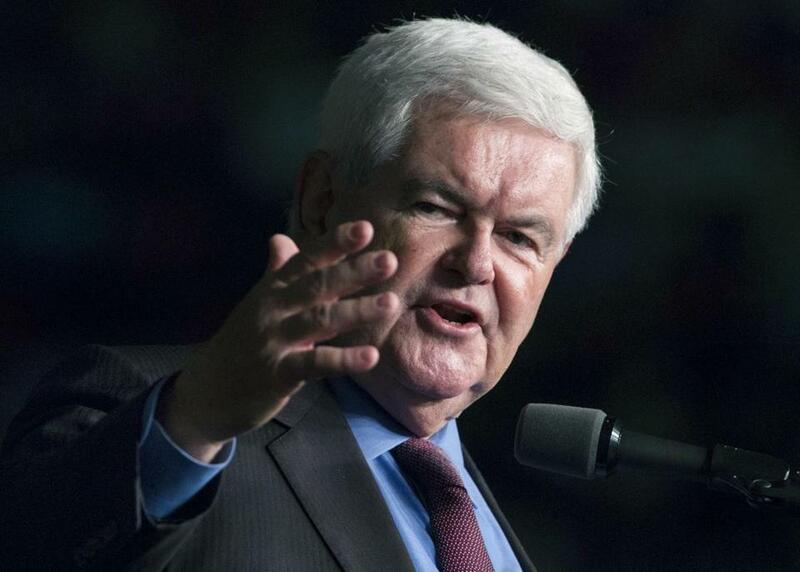 WASHINGTON — Twenty years ago, Newt Gingrich and allies pushing the self-styled Contract with America created an obscure but potent legislative weapon to help Republicans combat what they deemed to be out-of-control regulatory overreach in Washington. Republicans are readying an onslaught under what’s known asthe Congressional Review Act to cast aside a raft ofObama administration edicts, including rules designed to make it harder for US corporations to avoid taxes; environmental rules aimed at curbing earth-warming emissions; and sweeping changes to overtime regulations that were set to guarantee extra pay for an estimated 4 million Americans. Trump’s surprise election Nov. 8 triggered a flurry of activity all over Washington as congressional aides, lobbyists, and policy wonks scrambled to get up to speed on terms of the Congressional Review Act. People with expertise in its esoteric ways are suddenly in high demand. Batkins and his team had been writing about the act since last year, when its relevance was still hypothetical. The group recently put out a list of the 10 most expensive Obama regulations it could be used against, including the overtime rule. Another reason: If Congress uses it to successfully overturn a regulation, the agency is barred from ever again issuing rules that closely match what lawmakers rejected — unless Congress passes new legislation permitting the agency to do so. As Curtis Copeland, one of Washington's foremost experts on the CRA, put it, this is a legislative tool that salts the earth behind it. That could be just what the current Republican Congress has in mind. “If they don’t want climate change regulations to be issued in the future, what better way than using the Congressional Review Act,” said Copeland, on the law at the Congress’s think tank, the Congressional Research Service. The Senate Republican Policy Committee put out a potential hit list called “Reining in Obama Regulatory Overreach.” It includes killing a regulation that prevents states from blocking federal funding for Planned Parenthood. GOP senators also seek to eliminate new rules that prevent US corporations from avoiding federal taxes through “earnings stripping,’’ a key tactic in offshore “inversions’’ that corporations use to relocate to a lower cost country. The success or failure of Democrats to block the use of the Congressional Review Act is likely to rest on their ability to win public relations battles. “We are very confident that the public did not vote in this election to roll back our core environmental protections,” said Sara Chieffo, vice president of government affairs for the League of Conservation Voters. The rules environmentalists are preparing to defend: an Interior Department rule restricting the amount of methane — a potent greenhouse gas — that can be released into the air by oil and gas producers drilling on public lands, and an Environmental Protection Agency decision that airplane exhaust contributes to global warming. Republicans also will face time constraints. Given all that the GOP-controlled Senate will have on its plate early next year, from confirmation of Trump’s Cabinet nominees to moving big legislative items like a repeal of Obama’s health care law, most observers figure the Senate can handle killing off five to 10 of Obama’s regulations at most. So they will have to pick and choose. And Democrats aren’t going to make it easy. “This tactic is really unconscionable, especially for a president who had a populist message about standing up for people against the Washington swamp,” said Senator Richard Blumenthal of Connecticut.